Tag line: "A realistic film became too real! Shark will rip you apart!" By all accounts, Samuel Fuller did not have a good experience making 1969’s Shark. Along with changing the name of the movie (Fuller originally titled it Caine, after the lead character), its producers also re-cut it without consulting the legendary director, resulting in a version that so infuriated Fuller he demanded his name be removed from the final product. 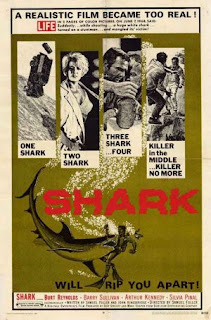 It wasn’t, of course; to this day, it’s listed as a Samuel Fuller film, but even in later years, Shark was such a sore topic for Fuller that he rarely, if ever, discussed it with others. It’s a shame, too, because, aside from some pacing issues, Shark is a fairly decent action movie. After losing his latest shipment (as well as everything he owns) in a showdown with the border patrol, gun-runner Caine (a very young Burt Reynolds) makes his way to a small port city on the Mediterranean. In need of a job, he takes the advice of the town’s drunken doctor (Arthur Kennedy) and hooks up with Professor Dan Mallare (Barry Sullivan), who, aided by his pretty blonde assistant Anna (Silvia Pinal), has been diving to the bottom of the sea, where he believes he''l find a food alternative that will solve the world’s hunger problems. Seeing as their previous assistant was killed in a shark attack, the Professor and Anna welcome Caine with open arms. But is it really food they're after, or is their goal of a more personal nature? I agree with Fuller in one respect: Shark is a terrible title for this film. Aside from the opening, where we witness the attack that killed the Professor’s assistant, the local shark population doesn’t figure much into the story (sadly, part of the reason the producers changed the title was to capitalize on a well-publicized tragedy that occurred during production, when, while filming one of many underwater scenes, a stuntman was killed by a shark). And while there are certainly some exciting sequences early on (including Caine’s run-in with the border police, which leads to a high-speed pursuit), Shark doesn’t really pick up steam until the final act, at which point its main characters no longer trust one another, and are looking for ways to stab each other in the back. Though it lacks the smooth narrative flow of some of Fuller’s better movies, Shark does feature several “Fuller-esque” touches, from its colorful characters (Caine befriends an adolescent pickpocket, played by Carlos Barry, who also enjoys smoking the occasional cigar) to its impressive action sequences (there’s a fistfight late in the film, between Caine and some henchmen hired to rough him up, that will drag you to the edge of your seat). These, coupled with its thrilling finale (I got a kick out of the various ways the characters tried screwing each other over), make Shark, at the very least, a passably entertaining motion picture.